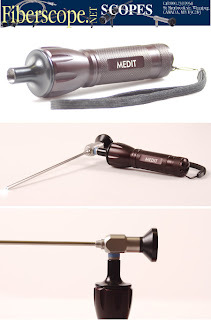 Medit Inc. presents a new 3W superbright powerful light source for any type of borescopes and fiberscopes. Medit Inc.’s Portable Superbright LED Light Sources are a convenient alternative to bulky Halogen and Metal Halide light sources, or unfocused LED light handles. Our LED light sources feature a convenient design, high intensity illumination, and low price. They combine reliability with durability by offering a low power 3W LED element, with a specially designed super-magnifying lens. This design allows for ample illumination, on average 28,000-46,000LuX, with low power consumption (3 AAA batteries for 2.5 hours of continuous illumination), and over 1,000,000 hours of lamp life per LED light source. In addition to the outstanding illumination and low power consumption our LED light sources are available with either an ACMI or STORZ threading. This allows you to use them with a wide variety of medical, veterinary, and industrial endoscopes, fiberscopes, and borescopes, for quick and simple inspections, or in the field. It also makes our LED light source a better choice than many of the higher Watt Light Sources on the market today. Discover the World of Medit LED Light Sources here!